We strive to provide our furry patients and their owners with Aloha, respect and compassion. We treat each and every patient as if they were part of our own family and welcome you into our PetVet family! This place has always treated us extremely well. We are an active duty family and really appreciate having friendly and professional vets right around the corner. There is also a discount for military families on certain things as long as you show your ID. Great job PetVet! Thank you for everything! Facility is so nice and workers are so sweet and joyful. Dr. Yasuda was so pleasant and very informative. Also very honest. She is all about helping her patients save money. No unnecessary labs if we don't need them. Don't hesitate to bring your fur babies in! You won't regret it. Dr. Anbe is the best vet! On behalf of Brownie and Cupcake Morikawa we'd like to thank her for her excellent care. Always going above and beyond, Dr. Anbe is just like family to us and our dogs. Thank you from the Morikawa family! 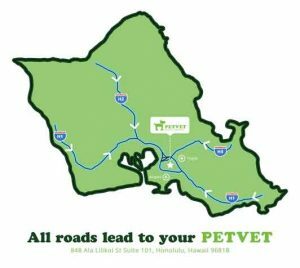 We followed Dr Anbe from VCA Kaneohe, and so happy that Pet Vet has an an excellent team of local vet doctors! The doctors here are all great and knowledgeable and compassionate in what they do, but the staff is very friendly too! Their prices are very reasonable too. This facility is a little over a year old, it's big and clean. They offer doggy daycare for both small and large dogs. (Dogs must pass an assessment.) The doggy daycare is clean, large dogs have an outdoor setting with water play (which my dog loves!) and daycare prices are reasonable. It's also good that if anything ever happens to my dog at daycare, his dr is right there. If you want to host a birthday pawty for your dogs with other daycare buddies, they offer birthday packages too. Dogs enjoy these pawty! They are located in the Salt Lake shopping center near Longs and McDonalds. Ample parking available, however loading zone in front of the vet is great for animal drop off and pick up, 30 min parking stalls marked in front are great for pet appointments too! Super nice staff! It was also easy to make an appointment as they are open 7 days a week and have late hours. Perfect since I work full time on weekdays as a lot of people probably do. They even asked for my dog's previous veterinarian so they could get the information faxed over. So no extra hassle for me! It is kind of far from town (in salt lake) but parking is easy to find as it is in a shopping center and I can always go later when traffic dies down! Dr. Nagata has been my cats vet for 11yrs now. I followed her to her new practice location in Salt Lake. She has always given my cats the best care and advice. My older cat Mushu is 22yrs old and healthy, my younger cat Bubba is 11yrs old. Both are in great health. Both have had ,illnesses, surgeries and ear infections. Both were cared for by Dr. Nagata. She does her best. Dr. NAGATA WILL CARE FOR YOUR PETS LIKE HER OWN AND STAFF IS VERY Helpful and caring. I would go anywhere on the island for Dr. To be my PETS vet.!!! PET VET IS THE BEST! Airmid, my 8-year-old Belgian Malinois, and I were early to our appointment at PetVet Animal Hospital. This gave me time to be nosy. The place is amazing! It has the things you'd expect--dog food, dog toys, etc. But I could see a play area and a relief area in the back through glass doors. The women behind the desk were also friendly and professional. We went there because Dr. Renee Nagata is our vet. We followed her from VCA Kaneohe, which is a mere 5 minutes from our house. Luckily, PetVet is about 10 minutes from our regular kennel/groomer, so it's still easy to go. Even if Dr. Nagata were far away, I'd drive my dog to see her. She's one of the few people who can examine my dog without muzzling Airmid, and she's very smart but in a low-key kind of way. She asks questions and actually listens to the answers, and then she'll explain the possibilities. She even gives me choices. For instance, she didn't just run a senior panel on my dog; she asked me if I wanted to run one. Oh! Dr. Nagata can also give Airmid injections without her noticing. During our last visit, she gave Airmid two shots, and Airmid didn't even notice a thing! First impression was 5 stars! First time called for an estimate about my Hana's spay surgery, my first language isn't English so I couldn't explain my question well, the staff(Her name Amela??) were absolutely patience and helpful. When I got there, the facility are very clean,all the staffs were friendly and they truly loving and caring the animals.Dr Rene was knowledgeable.Hana is recovering well now! Total price for female spay $480. Not sure if including next appointment for taking out the stitch in 2 weeks. I have nothing but good things to say about PetVet Animal Hospital. Staff is always accommodating and friendly and the two doctors I've dealt with are awesome. The first time my scared and traumatized (from a long trip from Europe to HI) puppy met Dr. Pearson, she didn't show fear towards her which surprised me. It's almost like Dr. Pearson had this "calm aura" around her and she's always made my pup comfortable around her. PetVet sells good products and a good brand of dog food (Farmina).